1 If you've gotten anything at all out of following Christ, if his love has made any difference in your life, if being in a community of the Spirit means anything to you, if you have a heart, if you care- 2 then do me a favor: Agree with each other, love each other, be deep-spirited friends. Words cannot express the deep regret I feel at having broken our engagement. Will you take me back? No one but you can fill the void in my life. Please forgive me. Love is one of those words that has become so watered down that it has become, quite possibly, one of the most maudlin and meaningless words in our vocabulary. It's one thing to talk about love shared among human beings but quite another to talk about the love of God. Humans are dualistic thinkers. We tend to think in either/or terms. We say things like, "You are either for me or against me." Dualism divides and alienates. In our dualistic thinking, we want or imagine a God who is for some and against others. We want a God who thinks like we think and supports our prejudices, likes, and dislikes. We forget that the God we don't know very well is personified in the person of Jesus Christ who is for and loves all of creation. God showed us His love by taking on human form and being born in a humble stable in Bethlehem. There is no dualism when it comes to God. The nature of God is love. Love is not an attribute of God. Love is the essence of God. As 1st John says, "God is love." When God creates, it is in love. When God rules, it is with love. When God redeems, it is by love. When God judges, it is with love. 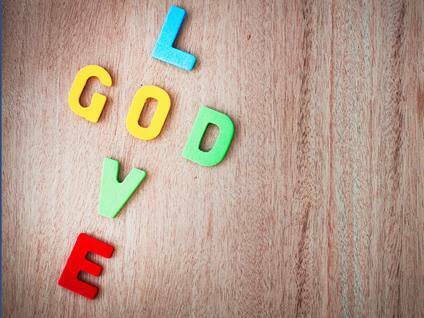 Every move and every action of God is an expression of God's very being, which is love. It is only by connecting with God in love that we can fully connect with others and be the mirror/reflection of God's love into other people's lives and into the world. As someone once said, "our very DNA is found in God." The Apostle in 1st John points to this fact: "Beloved, we are God's children now; what we will be has not yet been revealed. What we do know is this: when he is revealed, we will be like him, for we shall see him as he is."